There is an advantage in having a group of paddlers all paddling together in the same craft. Actually, there are a few advantages. The first one is that the group is always together. No one misses out on any of the information shared by the guide and the group is more likely to have an engaging conversation. If the weather gets a little rough, as it often does during the summer in Clayoquot Sound, the efforts of all the paddlers in the canoe are shared, no one has to stop and wait in the chop and current for another to catch up for safety's sake. The distances that can be covered in a set amount of time are greater than one would expect. Coming from a history of sea-kayak guiding, these are all things that I realized as I got used to paddling with Gisele Martin aboard her thirty-four foot dugout canoe "Sa-sit-qua-iis", or "Hummingbird". Gisele Martin and her sister Marie-France Martin are the owners of the canoe, given to them by their father, which Gisele and her boyfriend have used to launch their business Tlaook Cultural Adventures, out of her home turf of Tofino, BC. Cultures all over the world carve wooden canoes. Of these, the Nuu-chah-nulth canoe is considered one of the finest and most seaworthy. The often-challenging waters of the West Coast of Vancouver Island have inspired and required a canoe design that is capable of handling waves with grace and travelling substantial distances for these people who lived from the sea. The high wolf-head prow and raised stern block create a unique silhouette that is becoming familiar again in BC waters. At approximately eight hundred pounds, this hand carved cedar canoe full of average paddlers could easily outpace a forty-six pound Kevlar kayak over a distance. When a well-built dugout canoe gets up to speed, it's a magnificent thing to watch. While I was out paddling with Gisele on one of her guided four-hour trips in Sa-sit-qua-iis, she told about the time she and her father Joe were sailing their canoe with some others, down the coast in a strong Southeasterly wind. Her uncle Carl was heading to the same destination in the 70hp speedboat, and he was trying to keep up. The sleek profile of the canoe allowed it to run with the wind under sail, slicing through the waves that were causing trouble for the powerboat. As we paddle along the waters surrounding Meares Island, I ask Gisele about some of the larger journeys that she's been on in dugout canoes. It turns out there is quite a canoe culture that I wasn't fully aware of. Every year the First Nations of British Columbia and the Northwest States travel great distances on Tribal Canoe Journeys. Their destinations change annually and the most recent meeting that Gisele attended was in Vancouver, hosted by the Squamish First Nation. The crew she was with trailered the canoe to Nanaimo from Tofino and then set out across Georgia Straight in the darkness just before dawn. Their journey was an epic one of rain and fog, ferries and tugboats, friendly navigators and welcoming owners of convenient waterfront landing spots. In the end they joined the gathering in Ambleside Park, where the hosts and thousands of interested spectators welcomed dozens and dozens of seagoing canoes. It seems that the dugout canoes that have been used for thousands of years have created one of the strongest cultural pillars of the modern West Coast First Nations. The Georgia Straight crosser Sa-sit-qua-iis is named after a very similar canoe that was owned by one of Gisele's great grandfathers from several generations past. During its day it was the leader of the whaling fleet of her family. Many different sizes of canoes were used in the in those days. Small canoes were used by one or two people to go to food gathering areas, such as berry patches or camas bulb gardens. Larger ones were used to go whale hunting thirty miles offshore, or to carry war parties. The largest canoes were used to move entire households from summer village sites to winter village sites and vice versa. 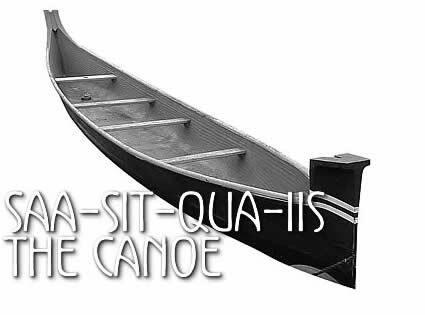 There are no plans to do any whaling with Saa-sit-qua-iis, though it feels to me that the canoe that we are in is worthy of the hereditary name belying its speed and manuverability. For a boat of its size, it seems remarkably easy to move through the water. I imagine it full of men who have trained and fasted for weeks to bring their focus onto the task their canoe was built for. Actually, when Gisele efforts a stroke with her big steering paddle I can feel the boat jump forward, and I wonder if she has some secret technique learned from her elders. As we paddle along I examine the adzed ochre-red interior of the canoe, each artful chip taken out of the single log in near perfect line with all the hundreds of others that create a unique skin inside the canoe. The outside of the boat is smooth and painted black. Gisele tells me that this black is paint, but traditionally the canoe would have been scorched by fire, to tighten the outer grain of the wood against insects and the sun. I also notice that at times we paddle quite close to the shore, and I am surprised that the bottom of the boat isn't touching the sand beneath us, which is only four inches or so below the surface of the calm waters of Lemmens Inlet. The flat bottom of the canoe seems to work in conjunction with the inherent floatation of the wood that it's made of, and we skim over waters as shallow as I could drift over in my kayak. The dugout canoe is a very beautiful and interesting piece of modern history, and as the yew-wood paddle flexes in my hand, I feel fortunate to be involved in its motion through the ocean.